And just like that it's been two months. 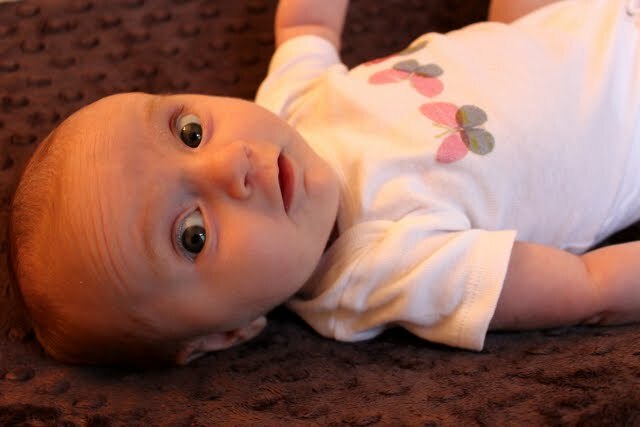 Ms. Piper arrived on Valentine's Day and it's been a whirlwind ever since. Bottom line, she's so rad. We love her to pieces. She's so adorable and she's smiling all the time these days. It's such a great payoff when your baby really starts to recognize and react to you after the hard work and effort that goes into that first handful of weeks. 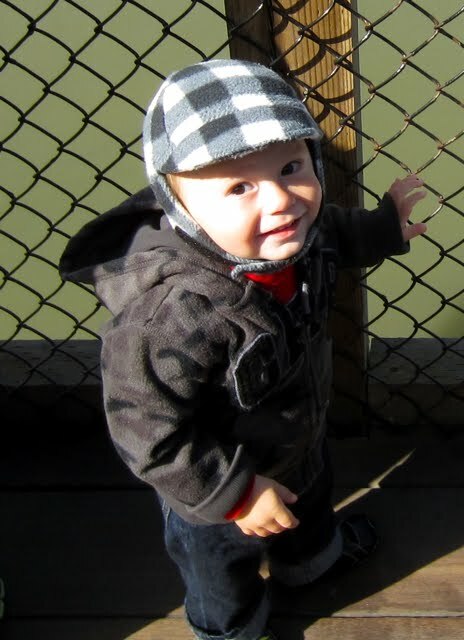 If you know our family well and have been reading our blog since Charlie was born, you know that Charlie was an atypical baby. Little to no crying, fussing, spitting up etc. 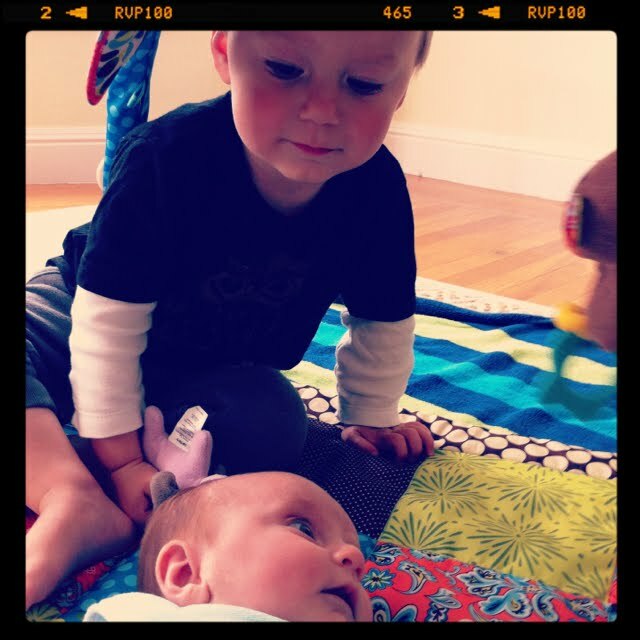 All the tough things that come along with parenthood. Piper is a little more typical in the standard baby behavior. She cries! Imagine that! It's funny...the first couple of weeks she was home with us she had a fussy period each night where she would be unhappy for an hour or more (gasp!). I know all you parents out there are rolling your eyes at us but this was honestly our first real taste of "normal newborn behavior." There were nights when she'd be crying for no apparent reason and Steve and I would think "what is wrong with her?!?!?!?" Hahaha...turns out, babies cry. Go figure. I think in comparison to other babies Piper would still be considered pretty chill but she has definitely been a bit more challenging for us but we are doing great and learning what little Piper is all about. She really is such a sweet little girl. These days after I nurse her, I'll prop her up on my lap in the boppy pillow facing me and we'll just smile at each other for a while. She has started to coo and make these little sounds that are so precious they'll melt your heart. She has auburn hair and her eyes are looking blue! I can't wait to see if the auburn hair remains or if it'll change as it grows in. After two weeks at home an interesting challenge developed. Piper started projectile vomiting on a daily basis. Not after every feeding, just once a day usually. Sometimes every few days and on a couple of horrible occasions it happened multiple times in one day. When I say projectile vomit, I mean VOMIT. It can't even be categorized as spit up. I'm talking she spontaneously just vomits up what seems to be cups of milk. Gross, I know. Imagine it all over you. It's lovely. 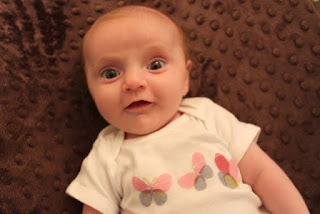 :) We were so freaked out about it initially that we talked to her doc about it and took her in on a couple of occasions but turns out that no one seems too concerned because she's been gaining weight well and all her other systems are go. So apparently it's just a messy situation more than anything. I started tracking her PV's (projectile vomits) and they were so random that I wondered if something in my diet was maybe causing them. Then, taking the advice of a good friend, I decided to try kicking dairy from my own diet for a while to see if that helped her. It's been about two weeks and she's doing so much better. We went almost an entire week without a PV! She's had a couple of doozies the past few days but it's so much better. I cry every night a little bit because I miss cheese but I'll survive. Her schedule right now is pretty great. She naps randomly throughout the day but typically goes down to bed anytime between 9pm & 11pm and she sleeps 5-6 hours. I feed her once and if we're lucky, she'll sleep until 7-7:30am. One thing we did learn the first time around is that sleep changes pretty regularly so we're enjoying the moment and trying not to worry about when it will end. 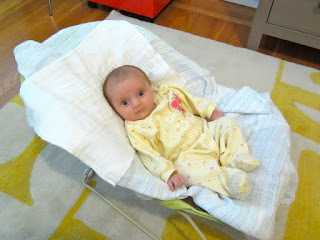 We've started feeling a little more comfortable putting Piper on the floor in her bouncy chair or on her play mat. We still have to watch Charlie like a hawk but they both seem to enjoy interacting with each other. Charlie has done such a stellar job adjusting to having Piper around. 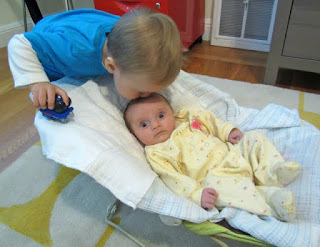 He loves her to death and insists on kissing her on the head whenever he can. It's good that Piper has the natural instinct to know that this situation is potentially dangerous for her. You can see it in her eyes. Piper's nicknames: Pipe, Pip, Sweet Pea, Sweet Potato, "BGS" (baby girl Santos), Pipenstein, Pukey McGee, Diva, Marbles. Charlie is quickly approaching 21 months and he is amazing. If I were to describe the past month in a couple of words it would be run and talk. Charlie has started to sprint everywhere. 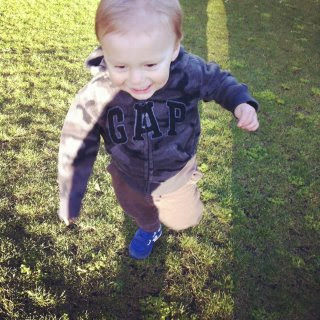 It's not enough to walk, he has discovered he can run! His vocabulary gets bigger/better every day. One week he had a handful of words, then it just exploded and he had tons. Now he's a parrot and will say anything he hears (kind of a rude awakening as a parent to hear your toddler repeating the not so lovely words you might say on occasion). The latest is he's starting to string words together into two or three word sentences. It's so entertaining and awesome to watch it all happen. He's so smart and can ID most animals, he can make their sounds, he loves to dance and sing songs. If you ask him what his name is he'll say "I'm Charlie!" He has a serious arm and can throw things overhand like a pitcher. He's also still cute cute cute and we love him times a million.